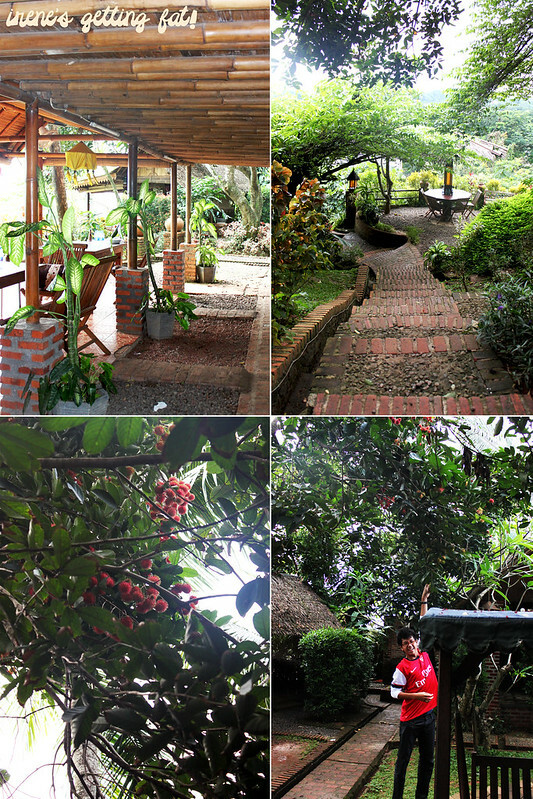 Do you like beautiful and natural environment at restaurants? While I am more of a street food hunter who don't really mind roaming at the humblest-looking shack to find a bowl of legendary meatball soup, the father is a huge fan of restaurants with natural environment, especially ones with fantastic view. So it's natural for him to drag us along to a restaurant who claims to have both. 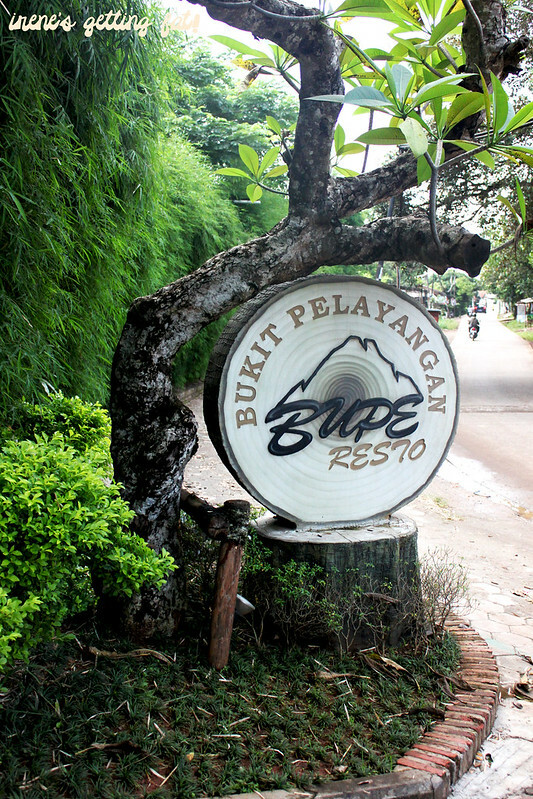 After being lost in a bustling traditional market and terrible traffic, we finally found Bukit Pelayangan, located on a small street, right behind a housing complex called 'The Green'. The exhaustion from the trip was replaced effectively with their warm ambiance, cleaner air (compared to Jakarta's), and heaps of trees. The view is indeed praise-worthy; a sight of small houses and green forest on the lower land. They have assorted kinds of seating, with the biggest one being a big shack (joglo) completed with projector and karaoke equipments. 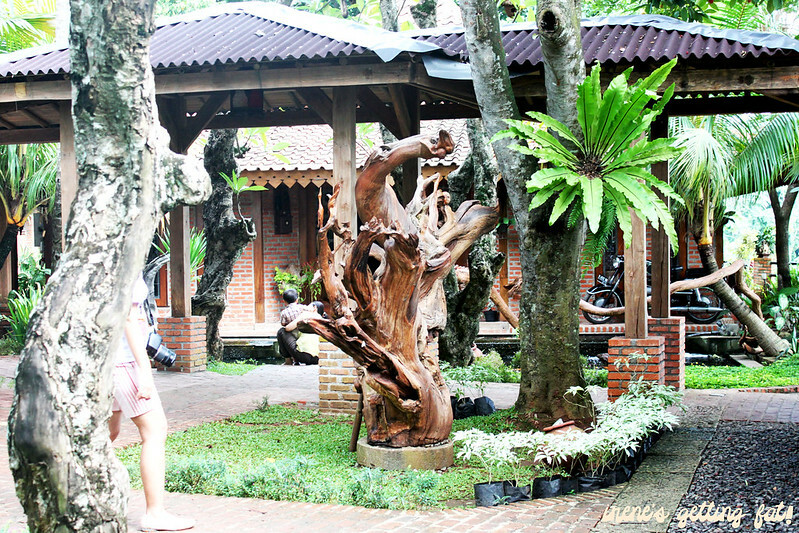 They also have smaller shacks and private tables for small groups and couples; all are quaranteed with beautiful scenery and relaxing environment. 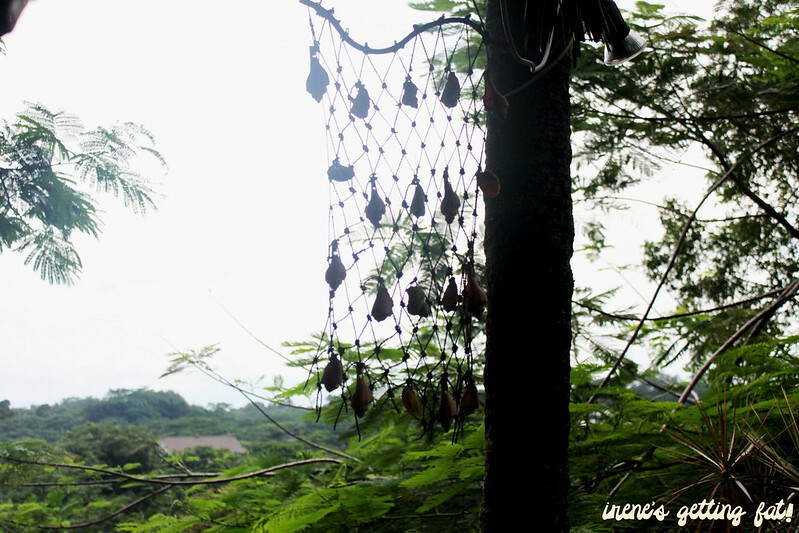 It would be a shame on us if we missed their ready-pick rambutan trees with red, ripe rambutan. And so we sent the brother on errand to pick as many as he can, as he's the tallest among us. 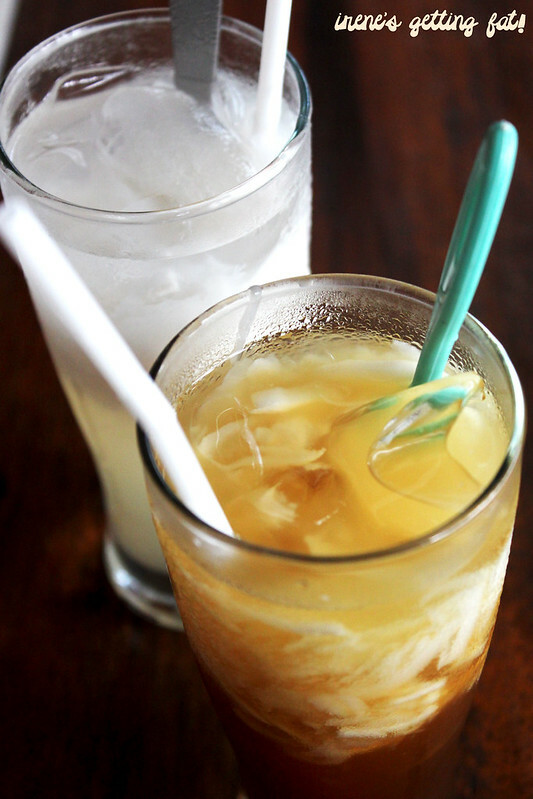 My drink was es kelapa muda (young coconut drink) with white sugar, whose twin was also ordered: es kelapa muda (young coconut drink) with brown sugar. 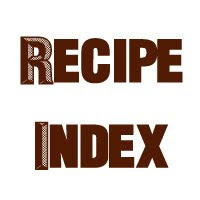 I prefer mine because the brown sugar tends to overwhelm the subtle flavour of the young coconut. 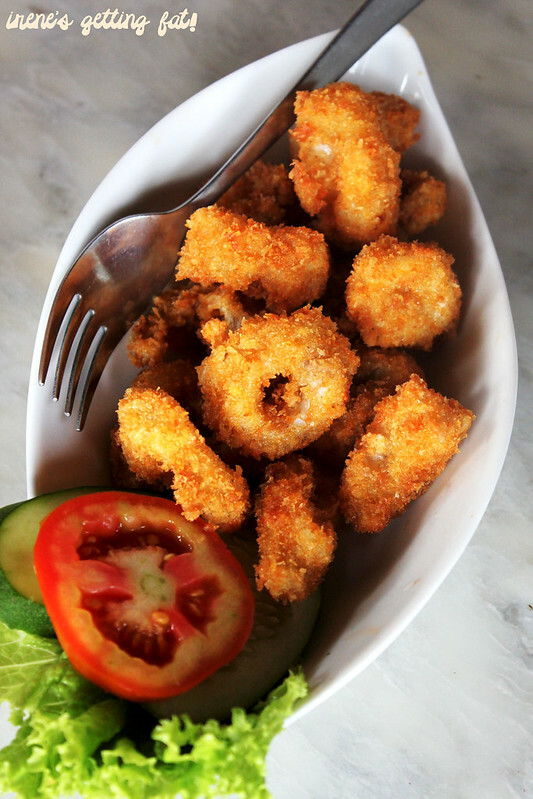 Cumi goreng tepung (crumbed, deep fried calamari) was great for nibbling; well-cooked fat squid rings with crumbly coat. 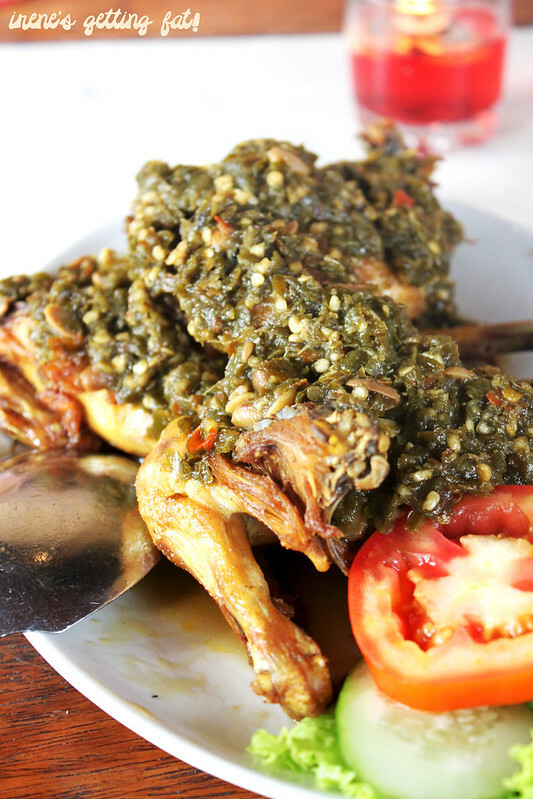 My fav item of the day was ayam ijo Pelayangan (fried chicken with crushed green chilli). The tender chicken with thin crispy skin is already good on its own, and the tasty yet fiery green chilli successfully induces excessive sweat and tears in my eyes. 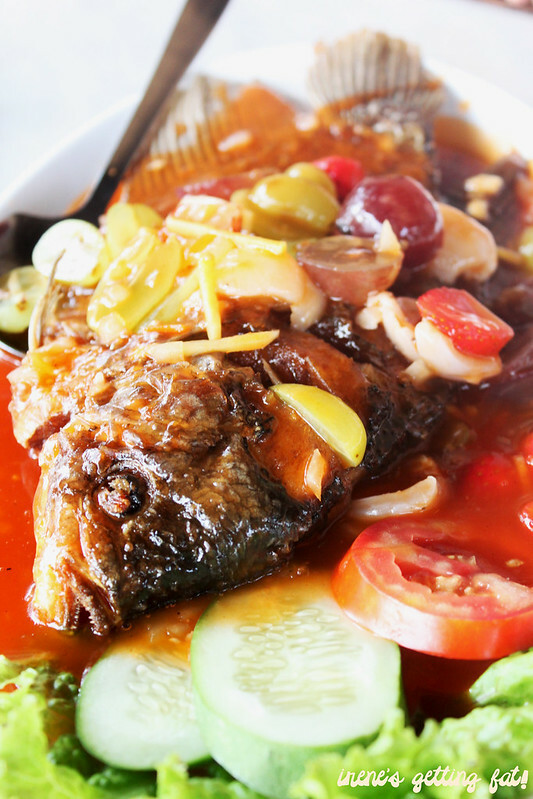 There were two fish dishes ordered: gurame saus buah (fried snapper with fruit sauce) which is crispy enough although soaked by the sweet and sour sauce with real fresh fruits (grapes, pineapple, strawberry, etc.) 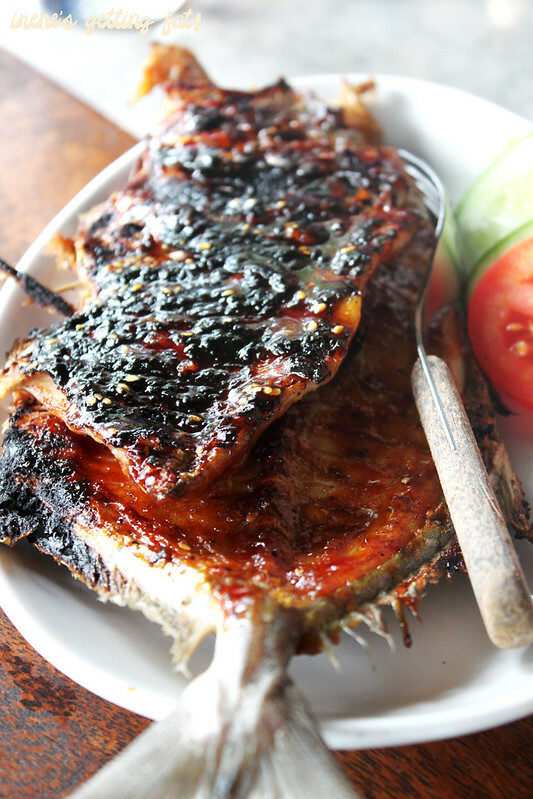 and gurame bakar (grilled snapper) which is less preferred due to a slight muddy aftertaste. 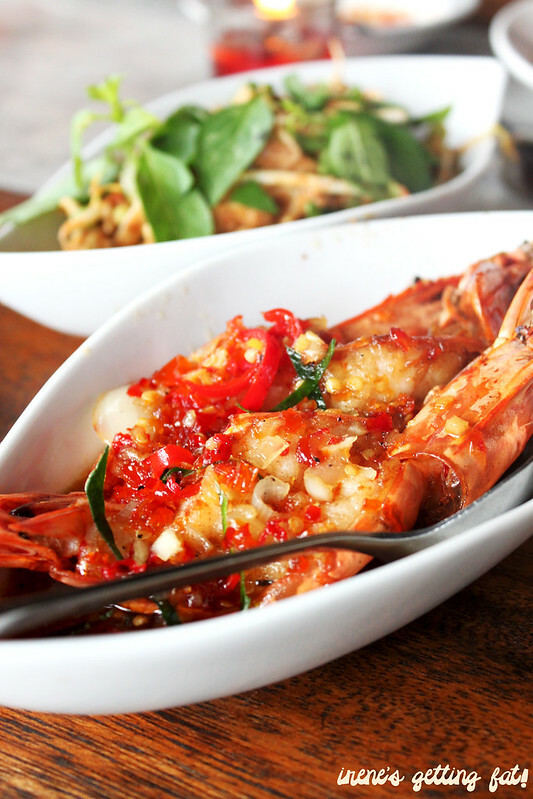 Udang saus Bangkok (prawns with Bangkok-style sauce) is quite attractive as well, with juicy prawns smothered in sticky sweet-sour sauce. We also had udang saus mentega (prawns with butter sauce) IDR 40,000/$4, but I think the precious is tastier. 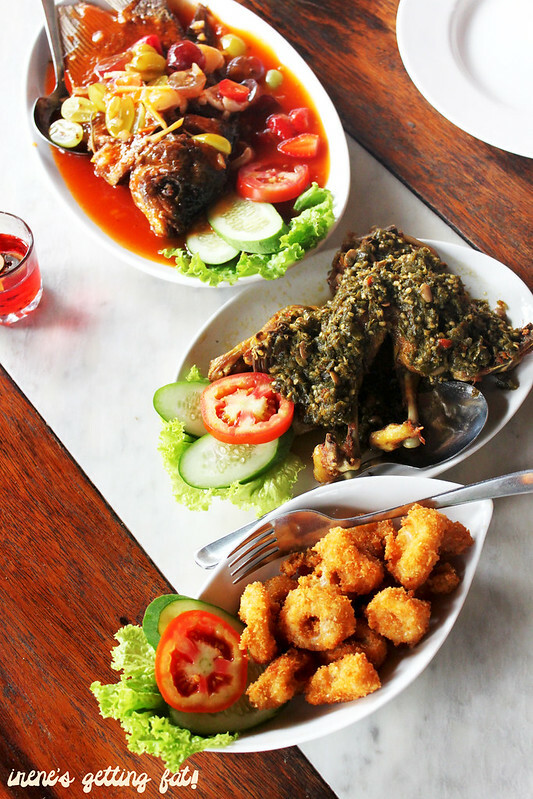 Healthier items were also present: karedok (Indonesia-style vegetable salad), kangkung cah polos (stir fried water spinach) IDR 17,500/$1.75, and tauge ikan asin (stir fried beansprouts with salted fish) IDR 17,500/$1.75. By this point, my hands were all covered with their amazing and stingy sambal dadakan (crushed chilli sauce) IDR 5,500/$0.55, I didn't even flinch to take photos of some dishes, sorry! 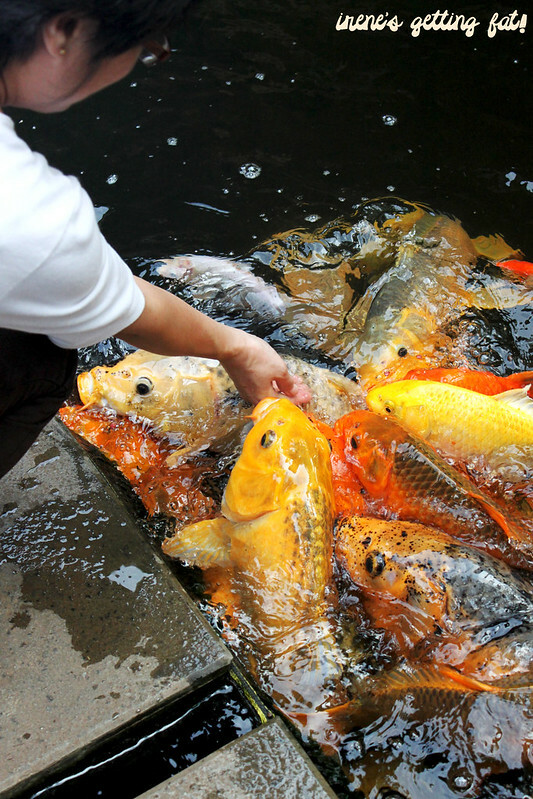 The relaxing lunch was ended by feeding huge golden fish which didn't mind eating straight from our hands. Not mine, I have problem with live fish. Recommending this place for any kind of gathering, and I reckon it will be as beautiful at night as it is in the day, as they seem to have many kinds of pretty lamps and twinkles. 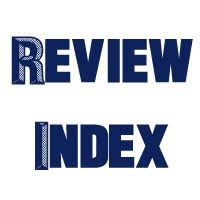 Great food with minimal turn-off points, beautiful and comfortable environment, ambiance very nice, service can be a bit slow but friendly, price is OK (considering they have such a beautiful environment). Two photos are THE winner. The first one and the goldfish. Just that two and you would've convinced me to go. In fact I'm asking my parents out hahaha. Well done!